Our community garden sits on a hill, while another heavily wooded hill continues the rise behind us eastward, toward Vermont. This picturesque setting quietly belies the insidious population (if not hundreds, at least dozens) of woodchucks. Also known as groundhogs, these waddling, middleweight rodents burrow masterfully. They joyfully excavate their little homes and then tenaciously tunnel their way right under any and all barriers to early spring vegetation. Which, while waiting for the wild plants to sprout, includes a delicious twenty-item salad bar conveniently located right in their own neighborhood, a snacking opportunity otherwise known as my community garden. For three summers I have battled woodchucks. “Battle” is not the most accurate word, since I tend toward nonviolence—so I haven’t engaged in hand-to-claw combat, or even met them up close–but fear not, their presence is clear. My plot adjoins the first groundhog-hole-under-the-fence that the locals dug my beginning year, when the voracious critters rapidly decimated my early-planted oak leaf and bibb lettuces. I wondered what I had gotten myself into. Would this Community Garden thing really be worth it? At some point that initial summer the gardeners rallied and plugged the holes, making the woodchucks reroute their speedy access over and over again; some folks fenced their individual sections, though I didn’t get quite that far. Finally, the groundhogs found enough tasty morsels outside of our chain link, and we breathed easier. Last year, my second year, I planted spring greens and then had to go out of town; I returned to nibbled-away spinach and the weeds that replaced it—It’s too late, anything I do will be destroyed; these nuisances are too numerous to deal with… If I weed now, isn’t that just a big “Come munch me” sign to the woodchucks? Finally, I volunteered to be the Garden Coordinator and now have the worst looking plot in the place! I became very sporadic in my garden visits. But one day I discovered that later seeds, half-heartedly tossed into the soil, had sprouted into sturdy, sprawling, bristle-legged plants, some with orange blossoms promising vegetables to come. The arugula I had allowed to overtake my lettuces seemed to have repulsed the woodchucks, as tender pale frisee revealed itself, barely alive under the weight of now-overly-spicy leaves. That second year I harvested more salad than the first, and went on to reap more than enough cherry tomatoes to pop into salads and put up for the winter. My belief in Community Gardening was strengthened. With memories of the previous summer’s bounty dancing in my head, this year I started in promptly on planting. During the first official workday in April, while I coordinated Perimeter Litter Cleanup and Getting To Know Your Weed-Wacker sessions, my newly recruited garden-mate cleared weeds in our plot; then I joined him to add the peat and compost, form mounds, plant seeds in double rows, and even put in a row of little cauliflower seedlings, carefully selected from the store for healthy stalks and lack of yellow leaves and well-developed but not overgrown root systems. I came back two days later and saw the plants chomped down to the ground, just one half-eaten cauliflower leaf to identify what had been there. Once again I felt discouragement in my gut as I surveyed the other, untouched-as-yet plots, and sighed. So, you thought perhaps the woodchucks weren’t around yet this spring? Or that they’d become stupid over the winter? Well, wrong on both counts! After a phone consultation and determined trip to the hardware store, my garden-partner and I returned to erect an orange plastic fence around our plot, digging slit trenches to bury the bottom edge underground. We sweated, we dug, and rather like Bill Murray in Caddyshack, we cursed the little buggers while giggling at our own nefarious devices. We still worried they’d get in—one vision involved finding woodchucks on their backs crunching carrots like babies sucking bottles; instead on the next few visits, we found the protected plot lavish with young basil and parsley, nasturtiums and acorn squash, and even volunteer tomato plants sprouting up! 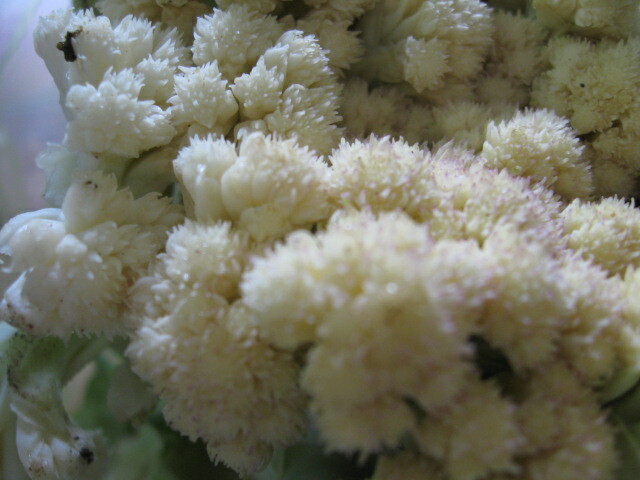 The survivor from that initial vegetable holocaust come back from its gnawed state to inch by inch grow some stunted leaves, and then larger ones, and it finally produced a single creamy-bumpy head of cauliflower–which I harvested this third week of August. But I have received more out of interactions with woodchucks than just, well, the skills of dealing with insistently burrowing rodents. More on that, next week. Since I am on my way out of town once again, here are some meals to sink your eyes into, from local non-chain restaurants. 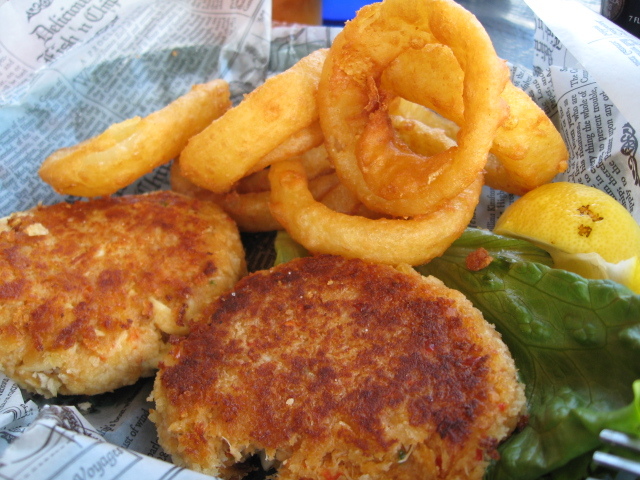 Ok, seriously fried food: crab cakes and onion rings, outdoors at The Boardwalk, Lake George NY. The view of the water and people para-sailing was more fun than the food; washing lunch down with local brews helped. I ended up taking most of this home, and reheating it in the toaster oven over several days. Also had to make big piles of vegetables to eat with it, as I am just not used to the oil. P.S. Never reheat crispy/fried/texture-driven food in the microwave; it’s such a disappointment. 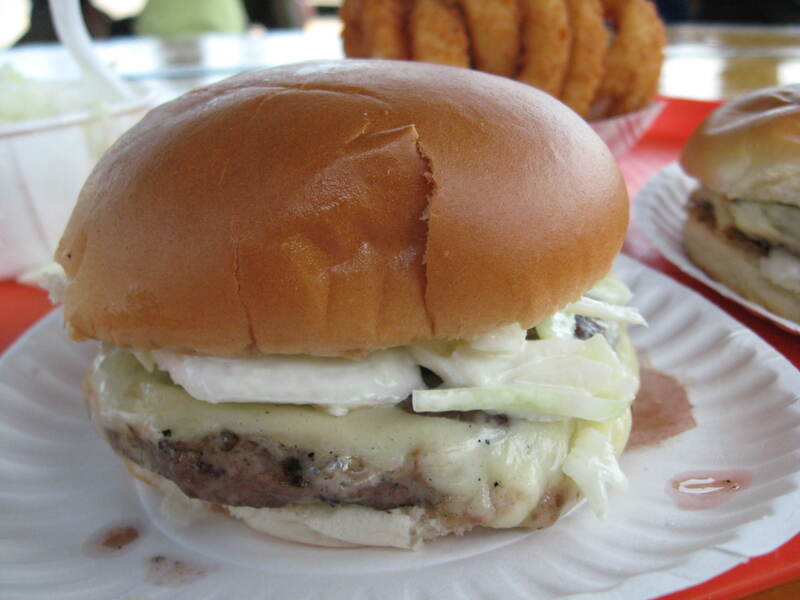 Next, cheeseburgers with slaw on top at Jumpin Jack’s Drive-In, Scotia NY, with a side of excellent onion rings; rode up hungry on bicycles for the first summer visit and on a motorcycle for the second. A large sweating cup of icy unsweetened tea rounded out the meal. Last summer we saw television pictures of Jumpin Jack’s under water from Hurricane Irene. Apparently they are all dried out now and back to long but quick-moving lines of customers again. I don’t eat that much red meat, so when I do it has to be worth it. Even then, I usually split a burger with other people, and nibble on two or three onion rings. Ok, maybe four. I really, really enjoy the zesty crunch of the coleslaw as my teeth sink into the salty cheese and meat. All right, maybe five onion rings, you know, if I’m really hungry. 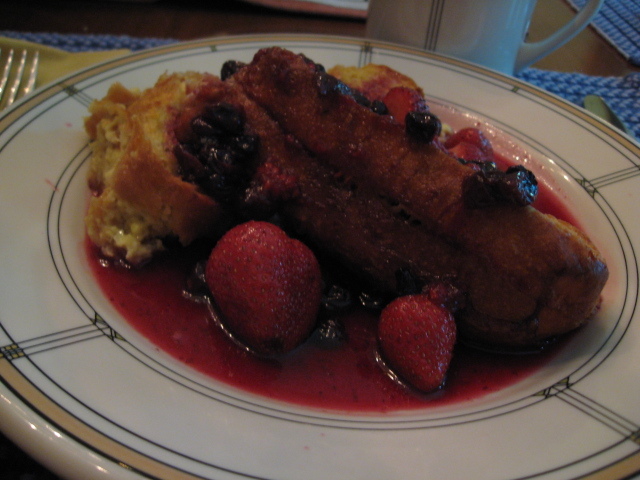 Oh my heavens, mascarpone-stuffed French toast topped by fruit compote at The Parkside House, Buffalo NY. The Parkside is a B&B three blocks from Frank Lloyd Wright’s Darwin Martin House (note the FLW inspired china). This meal kept me going for absorbing architecture in the morning, followed by three hours of hiking Niagara Gorge at Whirlpool State Park. 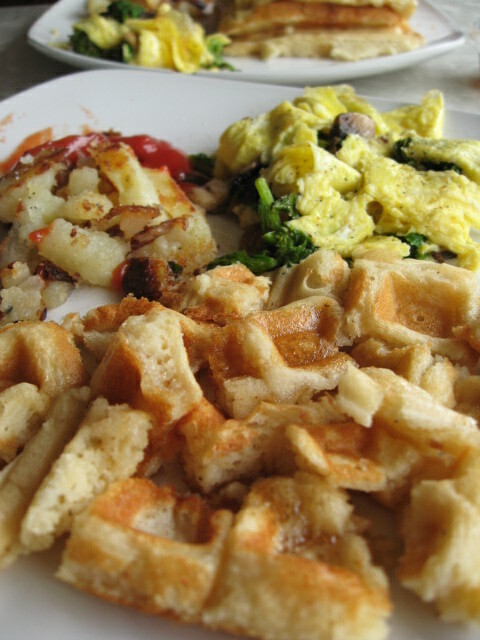 Thanks, Chris and Jonny–breakfast was delightful. 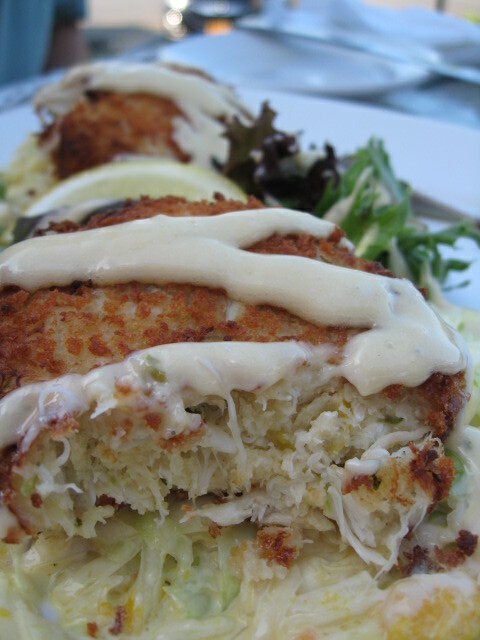 Crab cake with–get this!–lemon & vanilla-bean aioli (kept thinking there was something “chocolatey” about it ’til I double-checked the menu) over mango coleslaw, at Waters Edge Lighthouse Restaurant, Glenville NY. I suspect most people who dine out have a food they just must sample and compare to previous versions whenever they see it. Mine used to be chicken fried steak with sausage gravy (known in Yankee country as “southern” or “country” fried steak), but since I spend most of my time in the north now, I eat much less meat and fried food–oh, and I’ve eaten more than enough chicken fried steak for several lifetimes—I am now a crab cake taster. This exquisite cake proved one of the best ever, not too bread-y or fried-tasting, accompanied by such exotic flavors! What’s your “search out food”? The chicken satay appetizer (big enough for a meal), again at Waters Edge Lighthouse. 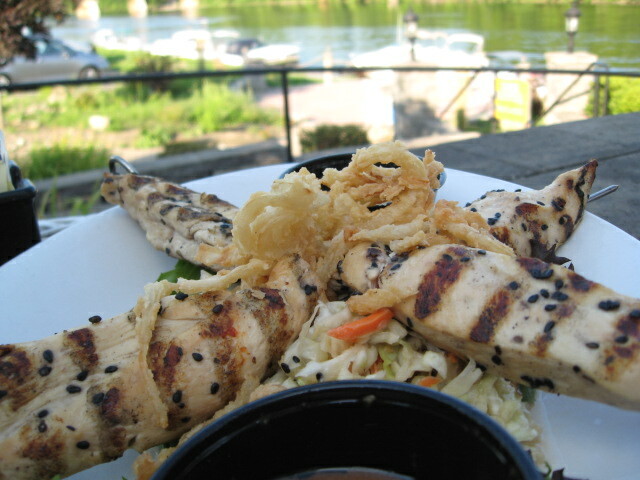 Note the Mohawk River flowing by behind the food, and yes, boats are bobbing there with the sun reflecting on them. Eating on the water is wonderful—especially when Hurricane Irene is not overflowing the banks; this was another restaurant that flooded last summer. 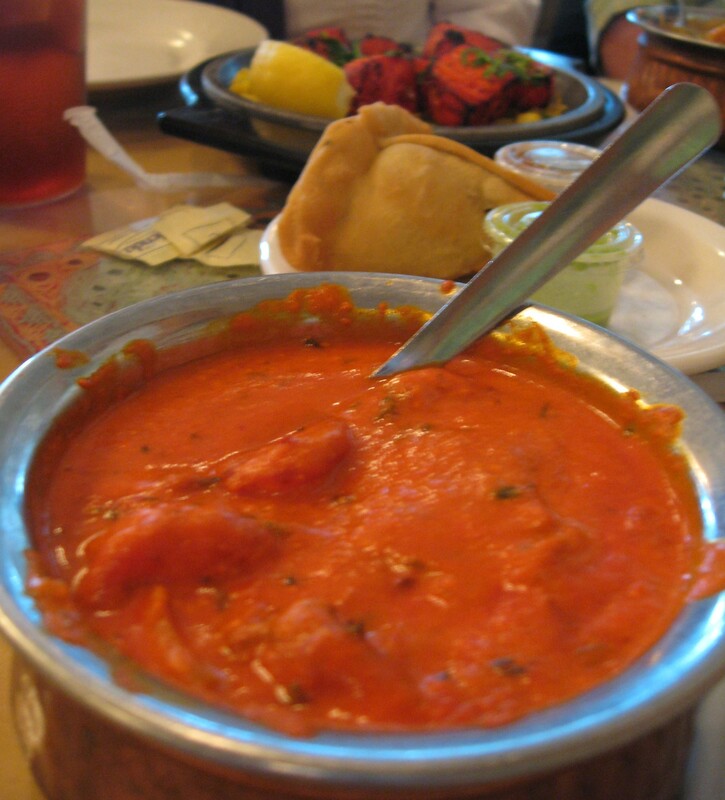 Vegetable samosa nestled behind a bowl of shrimp masala at Shalimar in Delmar NY. The creamy masala sauce with its peppers and onions is best eaten by dipping garlic naan (bread) into it, though you can eat an awful lot of naan in the process. I am also partial to the bund gobi aloo (cabbage and potatoes) all golden and yummy. NOT DESSERT—INSTEAD, PRETTY COLORS TO FINISH WITH. The beer flight at Madison Brewery, Bennington VT. The color, just look at the color and the varying opacities!—so many shades of red, amber, gold. 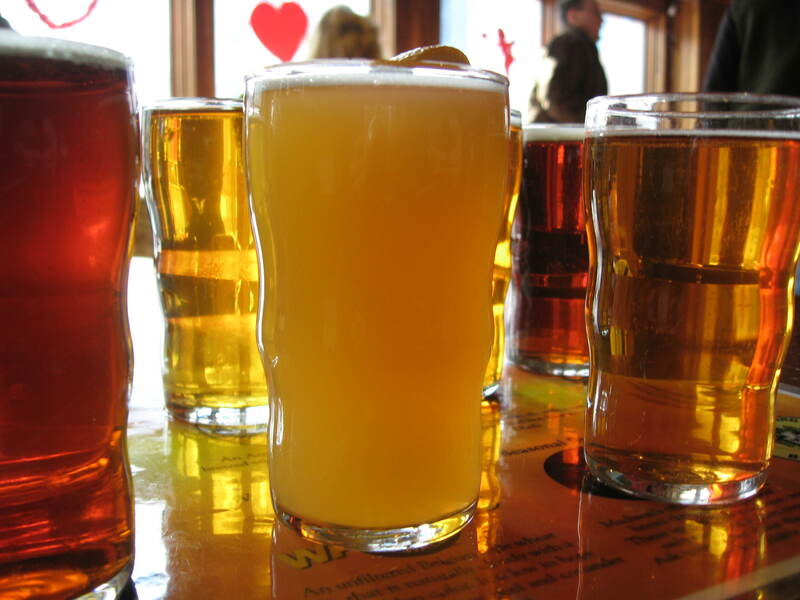 Included in this sampler were Crowtown Pale Ale, Sucker Pond Blonde, Wassick’s White Wall (the cloudy one), Buck’s Honey Wheat, Willoughby’s Scottish Ale, and Old 76 Strong Ale. 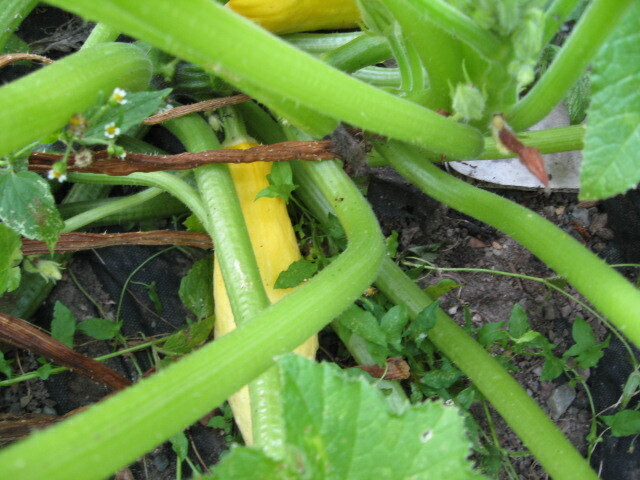 Summer squash in July–that survived the dreaded squash beetle. Last year R, who gardens in a nearby plot, caught me early one morning: Have you found any squash beetles yet? Yeah, I read about them on the website; here, let me show you what they look like….as he flipped over a big hairy leaf, to reveal even rows of orange eggs along the thick plant veins. You can control the beetles by squishing them with your fingers before they hatch. Ewwww, I thought. But I saw the damage already present in his plants. Ok, I can do that, I said out loud as I dutifully smushed the few eggs in my own territory. And mashed the increasing masses of eggs on the next visit, and the next few visits after that. My flowers developed into zucchini, acorn and butternut squashes by end of summer, as I researched the critters online, saw the destruction they were capable of, and stayed vigilant in their pursuit. This year I am a squash beetle pro. The nymphs are particularly icky—those orderly rows hatch into black-legged, white-bodied reminiscences of the robot spiders of Stargate SG-1; they rapidly swarm the leaf undersides, and stir up an ancient human response: Run away! Run away! As adults, they grow grey shells and crawl around as recognizable beetles, and so don’t engender quite the same gut reaction. In fact, I haven’t taken pictures of the adults or the lines of eggs, figuring people could just look that up if they were so inclined. Shudder. And the little spider-like stage, well, they skittle away too fast to take pictures. Double shudder. I have a dear friend who works my plot with me. Because the squash beetles in all their forms (but especially the alien-invader nymphs) horrified my garden-mate when he first observed them, I take it on myself each time we weed to quietly dispatch the egg masses without comment, rubbing them to annihilation between my gloved fingers, sometimes even taking the whole leaf off and boot-grinding the nasty things into the afterlife. This morning we went to the garden to weed and harvest again, and my garden-partner shivered as he noted, Yup, there are more of those creepy beetles. I moved in to take care of them. Later we pulled out a non-producing squash, found a gigantic zucchini hiding under another plant, plucked some sweet sun-colored summer squash, and then he jumped back—Ahh! There’s a g-d spider in here and it’s huge. I haven’t seen anything that big outside of the Adirondack woods! He caught his breath: Whew! It reminds me of the tarantulas back in Oklahoma that were so large they’d bounce their way across the highway. Literally. Boing, boing, as the cars went by. Well, this one wasn’t quite that sizable, but was enormous compared to what we’d seen previously in the garden. Very quickly, the initial startle was overcome by admiration for the arachnid, as we snuck in closely but carefully to observe it. Bright yellow markings on its back led us to the nickname Old Yeller. It wasn’t a stray like the loyal dog from the book, but rather a creature that belonged right where it was. Neither did it embody the “ugly” of the original character, but instead stretched out lithe chestnut legs onto a beautifully crafted web in the corner of the pole beans. 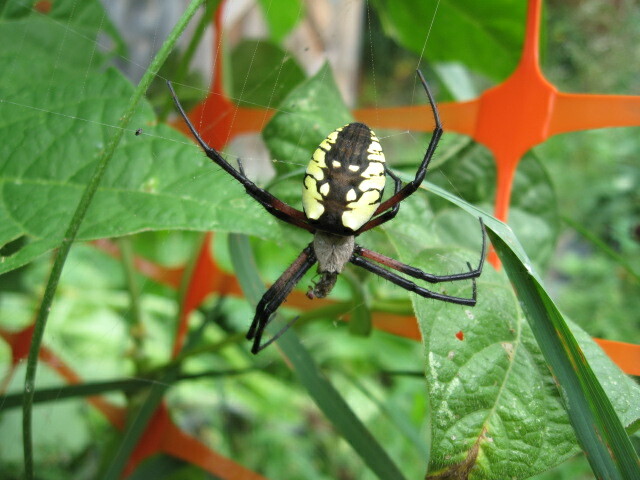 Our final thrilling discovery– it was chomping away on a silk-wrapped adult squash beetle! Tasty I suppose, if one were a spider (a bug-burrito, a calzone of creepy-crawlies) but who cares about gastronomic preferences when your nemesis is being destroyed? Not me. As we harvested the pole beans very cautiously around its bug-catching lattice, we cheered the helpful spider on: You go, Old Yeller! You’re a pal! Git those squash beetles! We worry a little it’s something poisonous that we’ll have to steer clear of, but, as I was musing afterwards, There’s lots of “dangerous” out there in the world--mosquitoes carrying West Nile Virus, ticks with Lyme Disease, and heck, even humans who will T-bone you with their truck because they are too busy texting. So I can live with “dangerous.” Especially if it’s swallowing those horrid squash beetles. I planted the seeds in May, thinking of slim pea-pods stir-fried with rice, but then the plants bleached in the July sun while I was home sick. Finally working in the garden, I thought, Damn, they are done, I left them on the vine too long! but harvested anyway. Maybe there will be some that are still tender…. Back in my kitchen, the pale, bumpy, now-inedible pods surprised me with actually-edible peas hidden inside! This gardener didn’t realize they’d continue on and make something different, like green bell peppers ripening into red. The big pile of Pisum Sativum pods yielded four ounces of fresh peas—they are sugar snap peas; that’s what I planted, and now I know the difference. For stir-fry alone, I could have planted snow peas. And if I’d gotten to these sugar snaps sooner, the pods (considered a fruit) would have been edible along with the green vegetable globes. Of course if I had just wanted plain ol’ peas, “shell” would have been the variety for me. 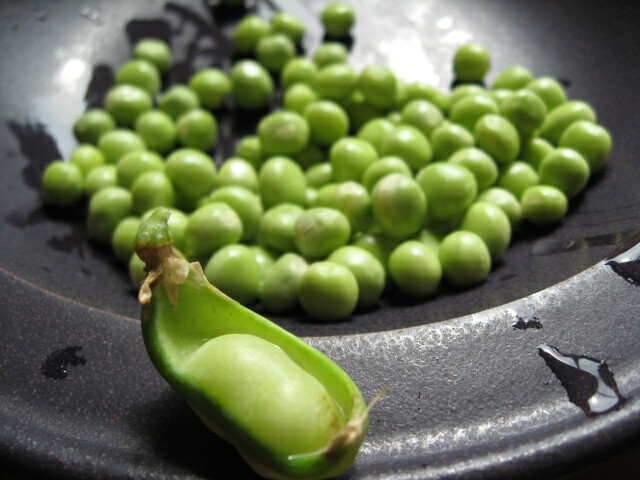 My other lesson for the day–Some of the peapods made just one pea. The thick skin cupped and protected a single perfectly shaped emerald ball. I used to be like one of the pods that made five, six, seven of these beauties, boom-boom-boom, lemme make some more! — I believed I had to be the pod that constructed the most and the most exquisite peas! But look–here is a capsule, so cute, so delightful, that curls around just one pea. Or maybe two, as in my photo, both well formed. What does that say about production schedules, quantity and quality of what we make? Sheepishly, I admit now that I don’t have to make “more”, “most”, “better” all the time. Just one pea can be enough. Some of the pods, bulky and hard to open, reveal withered peas, a few undeveloped blips, little nubs of pre-pea. The cases looked good, but the contents are not as promised. I don’t want that, either, to half-heartedly construct a life, the outside looking good but the inside empty. Or, if I see these as unborn creations, ones I didn’t have time or attention for, I could mourn, but not fret too much over them. Because there are plenty of seeds and soil and water, if I just keep returning to the garden. And thus, plenty of pods to come. Here’s what I made with the peas, again adapted from a favorite Moosewood Cookbook recipe; the original Sri Wasano’s Indonesian Rice Salad involves among other things pineapple and peanuts which, as you may imagine, is a whole different taste sensation. This is not the originally fantasized stir-fry, but satisfied my craving for savory rice with veggies. I served it with a butter-and-olive oil broiled, seasoned whitefish. Smoky Honey Rice, showcasing my fresh community garden peas. 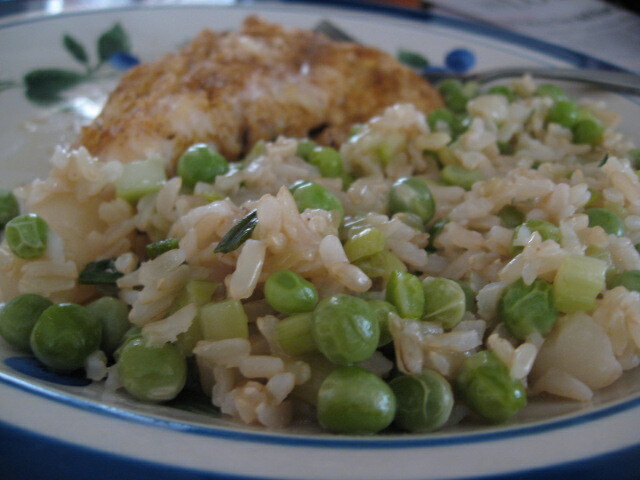 1 ½ cups of (organic) basmati brown rice, cooked in 3 cups of water–while still hot, mix with 4 oz of fresh peas steamed for about 8-10 minutes or until soft, 6 TB of toasted sesame oil, 6 TB of honey, a couple stalks of chopped celery, ½ bunch of chopped scallion (green and white parts), a can of chopped water chestnuts, 1/8 to ¾ tsp of cayenne pepper depending on how spicy you like it, salt or soy sauce & fresh ground pepper to taste.